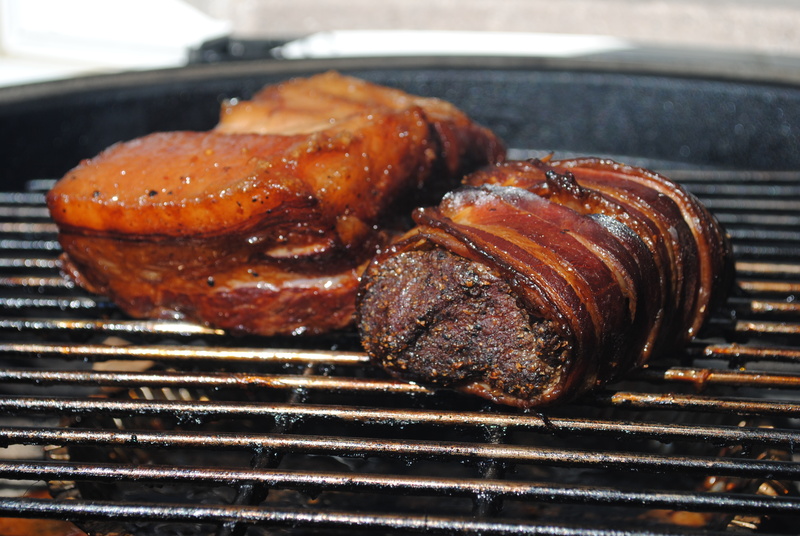 On a recent weekend, Venison Pastrami and Smoked Pork Belly became friends on the smoker together. The Smoked Pork Belly has been detailed here. Now we share the Venison Pastrami (hint: it’s the one wrapped in bacon). The basics of preparing pastrami are fairly simple: brine a two to three inch thick slab of meat overnight, coat with pepper and coriander, then smoke at 250 degrees until desired internal temperature is reached. Typically, this is prepared with a cut of beef brisket with a thick fat layer to keep the meat moist during the process. Michael Ruhlman shares a nice, traditional preparation at his site. In this preparation, we are using a venison tenderloin. Venison is naturally lean and the tenderloin is particularly so, which is why we wrapped the venison with Nueske’s bacon during the smoking process. But we’re two days ahead of ourselves. The process starts with the brine. Desiring to play up the earthy elements of the venison, rather than disguise them, we have used dark molasses as the sweet element. We have not used any curing salt in this preparation as our intention was to consume the entire amount upon completion. In a large pot, combine 1/2 gallon of water with kosher salt, sugar, molasses, garlic and 2 tablespoons pickling spice. Bring to a simmer, stirring until salt and sugar are dissolved. Remove from heat and add ½ gallon ice to chill mixture. Pour brine into non-reactive container, of sufficient size to hold the venison and then place venison in brine. It should remain submerged, weight if necessary. After at least 12 hours, preferably 24 hours, remove brisket from brine and rinse thoroughly. Refrigerate it for another day uncovered. Prepare the smoker. Combine the pepper and coriander and coat the brisket. Add a small amount of olive oil to help the spices stick. Wrap with bacon. Smoke at 250 degrees for 2 hours. Slice thinly to serve. We chilled the pastrami before slicing and served it on cabbage leaves dressed with black currants. 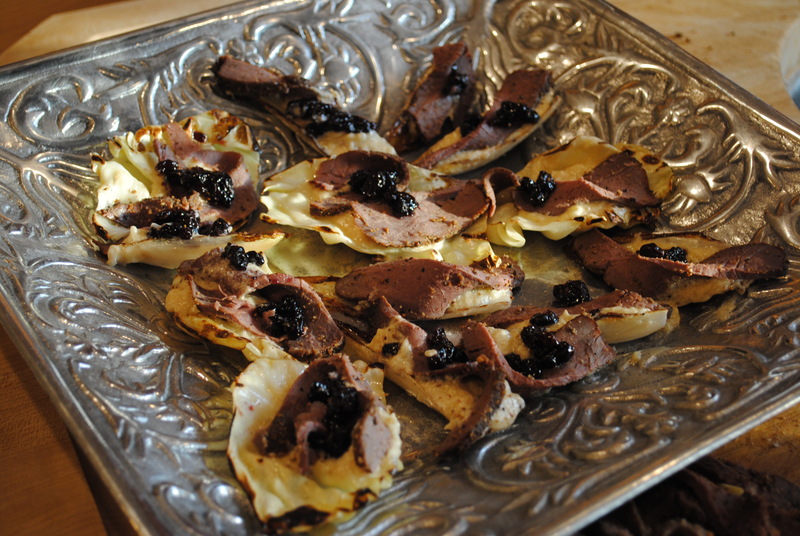 Under the venison was a dollop of a mixture of brie whipped with a puree of onions and apple cooked in bacon fat, again adding fat back to the preparation. The smoke played with sweet, the cabbage adding a nice crunch. Among the many blessings of friendship, I truly value the opportunity to create something together which brings joy to others. The mutual process of invention, from the spark of an idea shared through to final execution, bathes the whole process and product with a warmth and a glow. One of my favorite spice vendors, Penzey’s Spices, has a motto: “Love people. Cook them tasty food.” Perhaps the only thing better is to cook tasty food with them. So a recent week-end which featured cooking with Tom, one of my best friends from college, lead to some pretty savory creations which will be shared here over the next few posts. 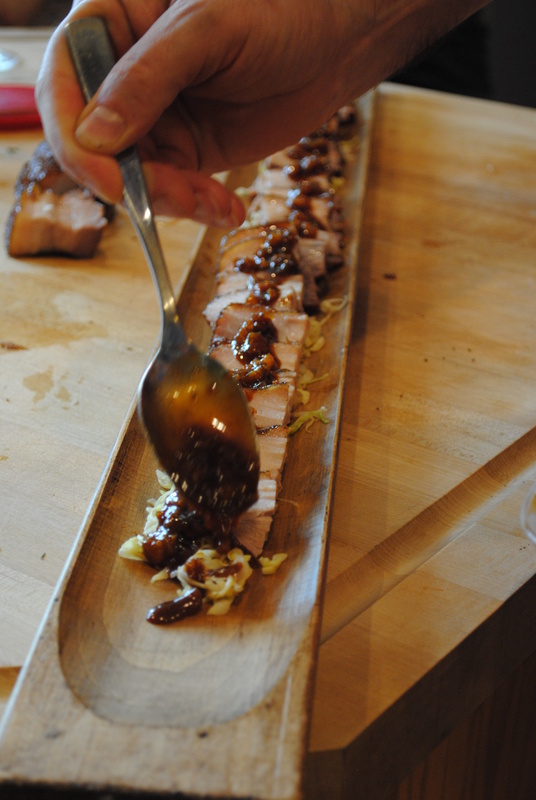 We will start with a creation of Tom’s which was a clear favorite: a Smoked Pork Belly appetizer. 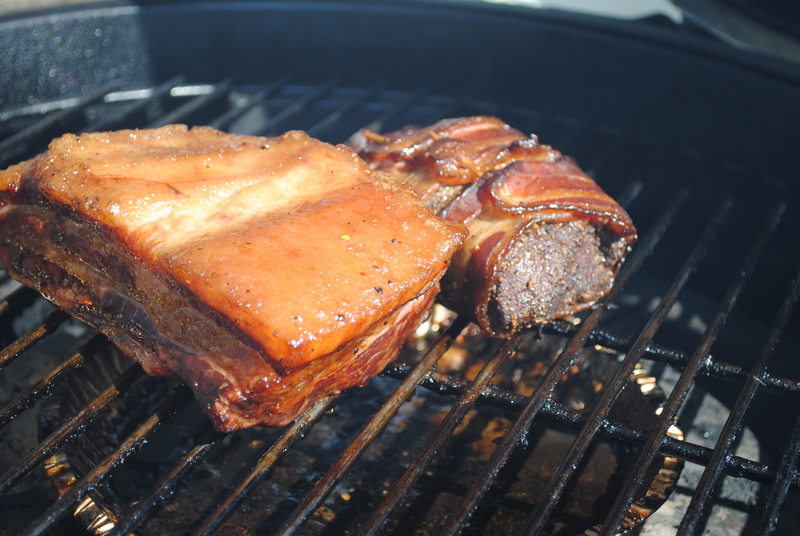 Combine the marinade ingredients, mix well, and add the pork belly in a container just large enough to hold the meat. Allow to marinate for 24 hours, turning occasionally to ensure coverage. After 24 hours, remove pork from marinade and allow to drip dry while preparing the smoker. This will smoke for 4 hours over cherry wood at 225 degrees Fahrenheit. We utilized a Big Green Egg, but the basic smoking instructions should be easily adaptable to any smoker. 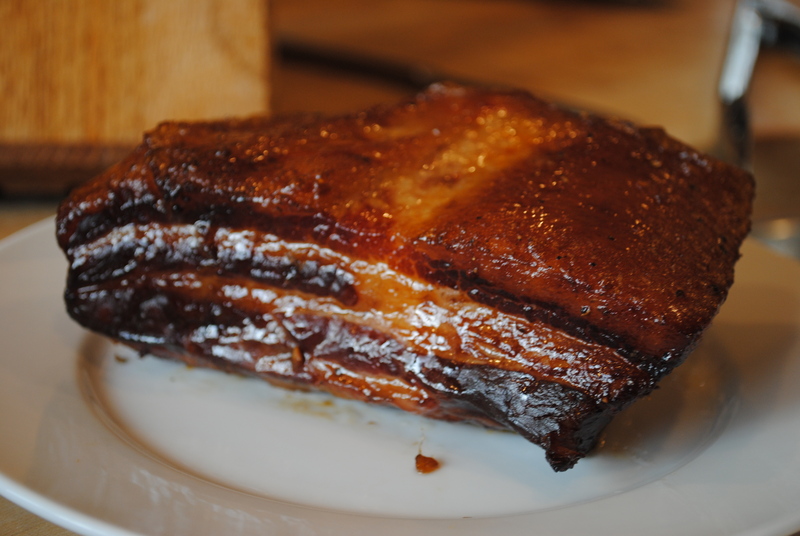 With the fat side up, pack the brown sugar 1/4 inch thick across the entire top of the pork belly. Sprinkle lightly with vinegar to wet the sugar, but do not wash the sugar off by aggressively pouring on the vinegar. 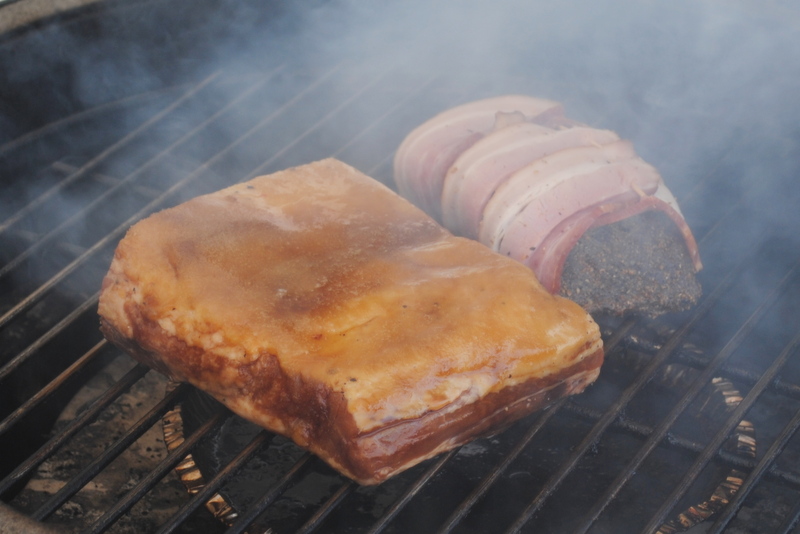 When the smoker is ready, place sugar side up and allow to smoke. We decided to serve this over a bed of finely sliced green cabbage sprinkled with the same malt vinegar used in the smoking process. It is worth noting, we specify malt vinegar above but the actual vinegar used in this recipe was a home-fermented vinegar made from Hinterland’s Saison-style brew. The flavors are somewhere between a malt vinegar and a champagne vinegar. So feel free to adjust accordingly. In a small skillet over medium heat, add all ingredients and reduce to a maple syrup consistency. 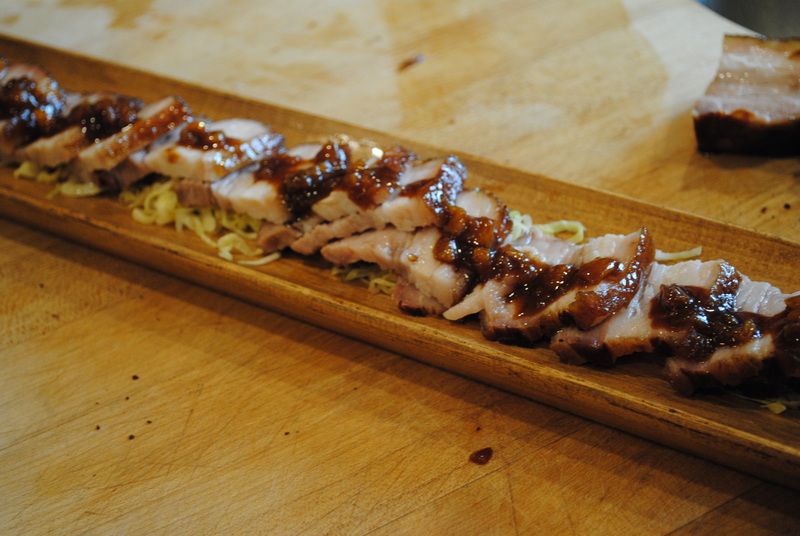 The flavors echo a good barbecue pork with a vinegar-based coleslaw, but with baconny-richness of the fat contrasted by the tang of the cabbage, the dish was elevated far beyond a humble backyard grill…except that we made it on a backyard grill, of course. A pleasure to make and pleasure to enjoy. If you have a friend like Tom, be thankful. If you don’t yet, start holding auditions. Create great food together and enjoy.